Hour Mars (@3Tau59 in 8th house); Fixed-Earth is strong and the chart is weighted on the Succedent side with balanced North-South hemispheres and an emphasis on the western side of Others-Partnerships, and possibly Open Enemies. 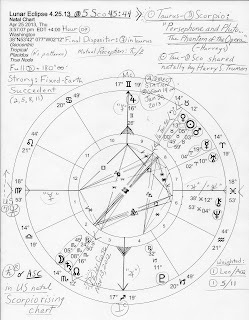 The trail of dispositorship leads to Venus in her own sign of Taurus (13:00 in 8th house conjunct US Inaugural Ascendants on January 20th noon in DC every 4 years); opposite the 2nd house Moon is the Sun @5Tau45:44 and Mercury 19Ari04 (degree of the Sun's exaltation) are also posited in 8th house of Debt, Credit, insurance, Shared Resources, Corporations, Transformation, Death, and the Occult--ruled here by Mars. And of course Scorpio is an occult sign with a Lunar Eclipse there denoting more secrets and scandals to unfold added to those revealed by the Solar Eclipse of November 13, 2012 @21Sco56 (the 2012 election eclipse); plus, the Nov 2012 Solar Eclipse fatefully conjoined US natal 12th cusp of Politics and Karma in the 5:10 pm 'Sibly' natal chart. 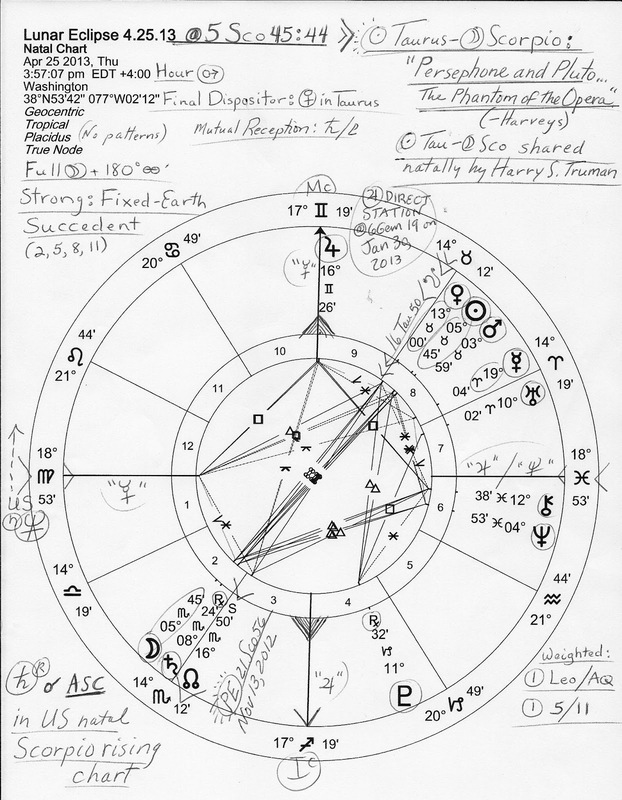 In Mundane Astrology, 2nd house represents the National Treasury and Moon there describes fluctuations, changes, and publicity, with the Moon ruling the eclipse's 11th house of Groups and Associations. Secretive Neptune in its own sign of Pisces, along with Chiron @12Pis38, indicates loss of jobs and employment on one level though I hope it also shows inspiration for creating jobs. Pisces is on the Descendant so there may be some confusion, even deception, is Partnerships and more problems for the US with Open Enemies, as noted above. Then there's radical Uranus in Aries in 7th house showing disruption and unrest from partners--or from those who should be partners such as Rs and Ds 'doing the people's business' rather than working to undermine the president in an attempt to score political points in spite of how their obstructionism and hatred for Barack Obama ruins our nation and makes us look like idiotic, childish weaklings overseas. Ironic how Republicans have for decades made a big show of their concern for America's 'strength abroad'. And since the Moon applies to conjunction with staid Saturn (2A38), Mr. Lesson Bringer has much to say about the proceedings issuing from this eclipse with chart-ruler Mercury (commerce, trade, insider trading and communications?) in Mars-ruled 8th house. Saturn and Mars are opposing one another (4A24) though the Venus-Saturn opposition is fading but 2/8 matters seem to be as stressful in late April into May as we know them to be with upcoming deadlines manufactured by radical politicians with ideological points to score and a Democratic president to foil. Yet motive always counts! And though the US is called "the great satan" in certain regions of the world (and drone strikes don't improve that opinion), I retain my faith in the American people as I do other populations of any nation I can name. Hierarchies tend to be what and whom I decry so with Pluto de-structuring or toppling governments and thrones the world over--and he's only just entered the 2nd decanate of Capricorn--my deepest hope is that no matter what disturbing secrets are uncovered in the coming year and how miscreants in Washington shake our trust in government, we'll depend upon decent folk to come through for one another and hold the line against corruption in high places. And if fortune should favor us, perhaps the guardian angel nature of benefic Jupiter at MC will provide a clearer and safer path along our moonlit journey into May 2013 and beyond once Sun and Moon perfect with complete awareness across the Taurus/Scorpio axis. For a handy list (including US planetary Return dates) try 2013 Solar and Lunar Eclipses. For excellent Political Astrology articles based on the US Scorpio Rising horoscope, visit Neptune Café authored by master astrologer Michael O'Reilly. And do check out Ed Kohout's excellent mundane work when you get a chance!